It may sound too good to be true! Since Facebook doesn’t want people to know who unfriended them, they don’t allow developers to access friend lists of other users. Therefore, there is almost no website or application that shows who unfriended on Facebook. One website that stands out for finding who unfriended, deleted or removed on Facebook is Unfriended by. This website is proud of the 2-minute easy sign-up process. After signing up, what you need to do is nothing! The site will send you email if somebody unfriends you. 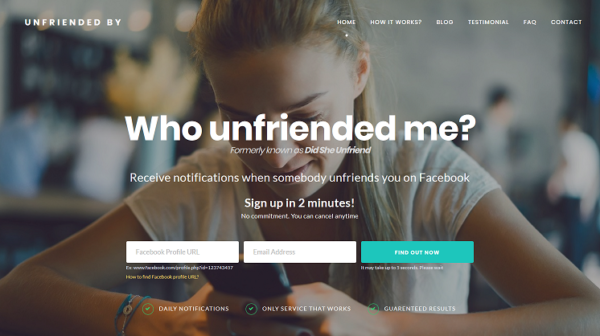 One fantastic website that automatically notifies you if somebody unfriends you! Unfriending also means deleting that person. For more information about finding out who deleted you on Facebook, check out our well-explained post: Who deleted me on Facebook? and why? Unfriended by has been tracking friend lists for almost 2 years! They constantly update the system to stay in sync with the changes to Facebook platform. This is the reason behind their guaranteed results promise. Unfriended by periodically sends emails to the members. These emails consist of information about who unfriended you, who added you as a friend, and the total friend count. It is a great feeling to get to know about people who decided not to stay in touch with you and people who wanted to connect. The total friend count makes these notifications even more valuable since it provides an easy way of tracking total number of friends. Please note that if somebody blocks you, it counts as an “unfriend”. Technically, blocking means unfriending. Therefore, this service shows you those who blocked you as well. Check our post for more information about finding out who blocked me on Facebook. A final note: Be extra cautious for those apps that claim to tell you who unfriended. Always check the recent reviews from other customers. To check Unfriended by’s reviews, visit the Facebook page. Previous postWho Blocked me on Facebook? Is There a Way to Unblock? Next postWho Deleted me on Facebook? What is the Reason?